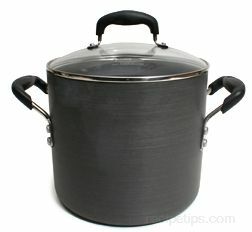 A large, deep pot that is most often used to make stock, soup, stew, chili, and to boil noodles, pasta, corn, vegetables, and seafood. Commonly made of stainless steel, Stockpots are available in a variety of sizes from 8 quart to 36 quarts for general home use and larger sizes for commercial use. However, the 12 quart size is best suited for a multipurpose use in the home. There are several different types of Stockpots and pot components, but most are made in a multi-pot configuration of an outer pot that holds a slightly smaller inner pot. The inner pot may be the steamer basket or there may be an inner pot plus a steamer basket. On the outside of the pot, there should be a set of handles that can be easily gripped to enable the Stockpot to be removed easily from the stovetop when heating foods or water. The width of many Stockpots will vary so when selecting, consider the value of having a wider rather than narrow width pot. The wider pot will allow for easier stirring, working with food ingredients and for cleaning. Wider widths may also be better for storage rather than having to store a taller standing pot. Materials used in construction of the pot may be stainless steel with an aluminum core or aluminum overall. Aluminum is a good conductor of heat so the foods are evenly cooked. Aluminum core pots will be heavier in weight and thicker in substance, which will assist with keeping foods from burning easily, a problem that may occur with lighter weight construction.